Hey Tampa Bay...here&apos;s your day 2 recap from here in Prague! The excitement and intensity is building. Most of the team members have arrived now. There are paddlers from many states across the country, including the Pacific coast states. 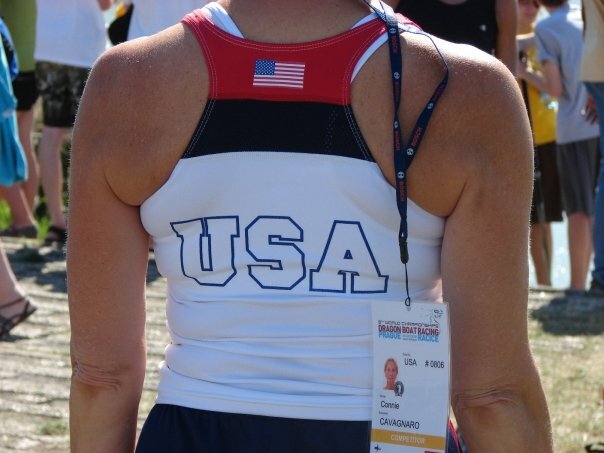 Eventually, we will have about 190 paddlers representing the United States. Our practice this afternoon went very well. Each of the nine teams and the two junior teams got to paddle together for the first time. It’s amazing how well each team came together and within a few minutes began to look like they had paddled together for a long time. We all feel the need (and pressure) to adapt to a common stroke technique as quickly and efficiently as possible. Coach Bob McNamara was incredibly patient getting each team organized and briefed regarding the various strategies and techniques each team would employ during the races. The practices weren’t long, like the ones we have during the regular season. These are tuning and technique sessions; starts, transitions, power series, finishes, etc. I’m sitting in the back of the boat. On the Senior A men’s team I’m in row 9, and on the Senior B Mixed team I’m in row 7. I’ve always paddled from row 4 in Tampa, so I’m adjusting to the water moving more from the paddlers ahead of me. It makes me want to work even harder. Fitness and the ability to adapt and keep up is assumed and expected. No problem for the Florida contingency! I was breathing pretty hard a couple of times, but don’t tell anyone. I didn’t let it show! The weather is gorgeous. . . warm, sunny and perky. Sometimes it’s a little hard to concentrate. Remember, we’re in Europe. It’s summer and the race facility is essentially open to the public. There is a paved road around the entire water area so it’s a great workout area. While not crowded, there are cyclists, runners, roller-bladers and sun bathers. Yes, sun bathers. It’s Europe remember. And there were couples along the shore sunbathing. So, on a couple of runs down the course our steersperson, Simon Shum (Miami, remember) seemed to only be able to find an open outside lane, outside, like close to shore. The view on shore required our drummer (Angela) to bark “eyes in the boat” many times as we paddled down the course. I think it did give our team a lift. At the end of practice, everyone was pumped at how well it had gone. . . not perfectly, but very well and we knew that tomorrow we’d iron out the last bugs and be in great shape for Wednesday’s opening ceremonies and the first official races of these 9th World Dragon Boat Championships. We were slapping each other’s backs and high-five’ing. This is going to be fun! We hopped back on the buses for the hour trip back into Prague looking forward to hot showers and a good restaurant for dinner. This is a long way from the Tampa Bay dining and Tampa Bay nightlife that we are used to, but it&apos;s great! Lights out will be early tonight because our last practices before racing are in the morning. Good night, and more later.